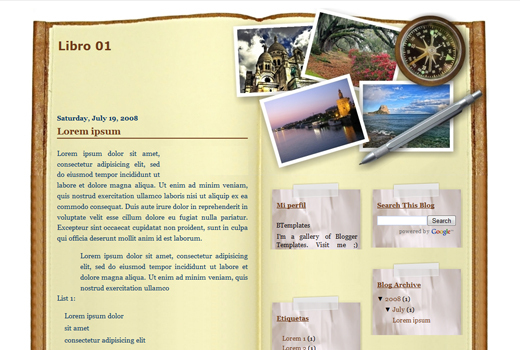 Libro01 blogger template for free download on Blogger Templates. Thanks for this very beautiful layout. I have downloaded it. Thanks again. I tried to download, but file is currupt. very serene. Peaceful. and clean. Hey! Love this template, but I am wondering if you can edit photos to be your own and if so, how? I’m not very technical, so forgive me if this is a stupid question. Do you know how to use photoshop? Because if you want to change those pictures you need to be able to use photoshop to do that. there you will find the url link to the image containing the header banner with the photos. You can edit it via photoshop then upload it to a free image hosting site and then replacing the url there with your new url and it will show up your own photos. The installation and settings link doesn’t seem to work. It just opens a new tab with the bloggertemplatesfree homepage. Can someone fix it? Thanks! To install this template, after downloading it you would need to unzip it. You can unzip it by using winrar, winzip, 7zip software, google them to download its free. After you have these unzip software, rightclick on the downloaded file here and select Extract all. Once you have done that you are able to open the folder and you will see Libro01.xml file. Now go to your blogger dashboard -> Layout -> Edit HTML and you can see a text field to upload your template file which is Libro01.xml. After you have uploaded it, Save the changes and the template will appear on your blog. ThankS A LOT Swank. Didn’t know the reason why there were unknown symbols when uploaded. Thanks a lot!! how to make the file .zip to be unzip ? tell me please. You need to download winzip, winrar, or 7zip software in order to unzip the file. These 3 softwares are free to download, google them. cool! i like this so much! I am an absolute novice to webdesign and blogging but not to my subject matter. Can I add video to this template and will it work for Adsense? Lovely template. However, is it possible to change the font in the header and the blog text? Would love to be able to adjust it a little. Also, where on the template is it possible to click for putting up new posts or editing? You can go to Edit Design and search for font and you can see the font type and color to change to the one you like. If you like to edit or add new posts, you need to go directly to your blogger dashboard to do it. Just wondering where do i download this skin from?